Sir Alex Ferguson will reshape his humiliated Manchester United squad after their Champions League debacle against Barcelona. I think Shell-shocked Fergie has decided he will not take up the option to buy Carlos Tevez, even though David Gill will be meeting up with Kia Joorabchian tomorrow to try to come to some sort of arrangement. I think too much damage has been done to the relationship with Tevez now. After all his efforts and some timely goals for us too, he now feels terribly let down by Fergie. At the same time, Nani and Ji-Sung Park could also be high-profile victims of the Rome drubbing. The United manager believes Lyon’s Karim Benzema represents better value for money than Tevez – and to meet Lyon’s £30million asking price there will be fall guys. Nani has failed to impress in his second season at United, while Park may be sacrificed so Fergie can bring in Wigan’s £15m-rated midfielder Antonio Valencia, a long-term target. 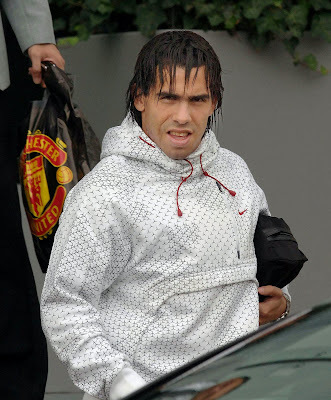 Tevez was the only senior member of the squad not to return to Manchester with the rest of the United party yesterday and wore a tracksuit to the subdued United post-match party, rather than the official club suits his team-mates adhered to. One player staying put is Cristiano Ronaldo. New Real president Florentino Perez is targeting AC Milan’s Kaka instead, while former Real icon Zinedine Zidane, whom Perez wants as his sporting director, rates Bayern Munich’s Franck Ribery above Ronaldo. I'd rather have Nani out than Tevez but I really feel as though Park has earned staying on the squad. Nani really didn't impress me this season but I feel that starting or subbing with Tevez or Park can really have an impact on a match...impact that has been needed this season with Ronnie scoring less than the 2007-2008 season and injuries. But I can understand the way Tevez could feel underused and let down by the club, especially Fergie. The fans love him but I think the damage has been done as well. I do like Benzema though and think he'd be a good addition. I've never been fond of Tomasz Kuszczak and will be glad to send him off.